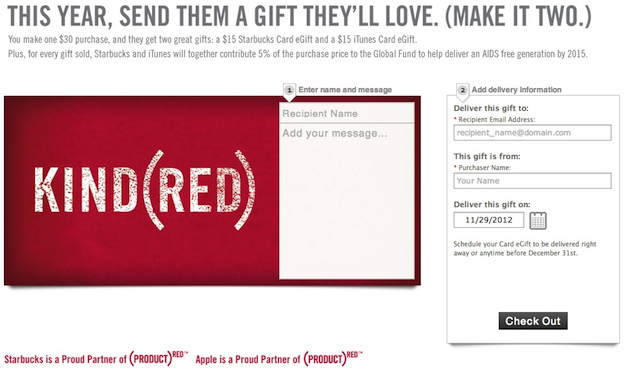 Apple and Starbucks have teamed up for World Aids Day, offering US residents a $30 (RED) eGift basket comprising a $15 eGift for Starbucks and a $15 eGift for iTunes. “For every gift sold, Starbucks and iTunes will together contribute 5 percent of the purchase price to the Global Fund to help deliver an AIDS free generation by 2015,” Starbucks said in a statement released Thursday. The cards can be used for purchases in-store at participating Starbucks outlets in the US as well as from its online store, and from Apple’s iTunes store too. Anyone interested in finding out more or wishing to make a purchase should click here. Those familiar with Apple’s product line-up will know the tech giant has long been involved with the (PRODUCT) RED campaign, set up in 2006 by U2 frontman Bono and Bobby Shriver to join forces with brands to help raise money for various initiatives such as AIDS programs in Africa. Apple sells a range of red products, with a portion of profits going to the Global Fund which helps distribute funds raised by (RED). The Cupertino company currently offers red versions of the iPod Touch, Nano and Shuffle devices, as well as a red iPad Smart Cover, Smart Case and iPhone 4S Bumper. It’s not the first time Apple and Starbucks have worked together. In 2007 the companies launched Song of the Day offering Starbucks customers free songs from iTunes, followed up by a Pick of the Week deal which last year started to include apps as well as songs. More recently, it was one of the first companies to announce integration with Apple’s new Passbook digital wallet, launched as part of iOS 6 in September.